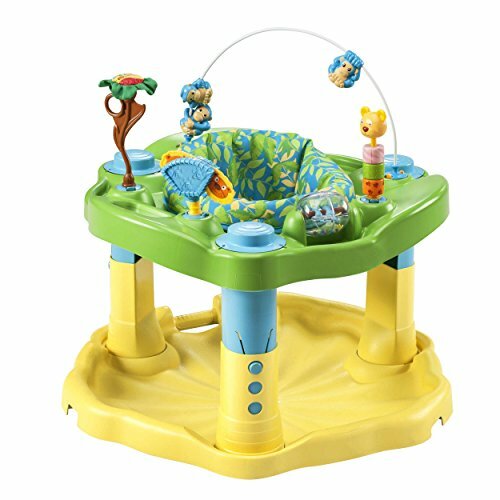 The Evenflo ExerSaucer Zoo Friends offers parents a safe alternative to walkers. With a variety of age appropriate toys that help your baby achieve important developmental milestones. With rock, spin and bounce actions that provide your baby with plenty of exercise to strengthen legs, back and neck muscles. Plastic Parts: Wipe surface clean with cloth slightly moistened with mild soap and water. Allow to air dry. Seat Pad: Machine Wash Separately, Cold Water – Delicate Cycle. No chlorine bleach. Tumble Dry: 10 – 15 Minutes on Low Heat – Remove Immediately.